Ignore the cheesy cover. It's good! What would you do if you had one year to live? In The Blue Castle by L.M. Montgomery, Valancy Stirling hates her life. It's her 29th birthday; she's lived her whole life in an old house with her mother and cousin. Her life shows no signs of changing. The Stirling family bullies and bosses her around but she's afraid to say anything because as an unmarried woman she depends on their generosity. She doesn't want to end up a poor, old lady. On the sly (because she can't do anything without a Family Committee deciding for her), she visits a local doctor about pain in her heart. The diagnosis isn't good, she has less than a year to live. It's a shock but it also frees her. What is there to fear when you're looking death in the face? Now Valancy decides that she will live the way she wants to live, starting with telling her family what she really thinks of them. They are shocked! They think she's crazy! What will we do about Valancy? they say. She doesn't give a fig. Instead, she moves in with a dying woman and her father, a pair of social misfits, to keep house for them. A Stirling does not keep house for a drunk and a 'bad girl'! The Stirlings are an old family built on appearances but those appearances are skin deep. Underneath, they are shabby, miserable people. When Valancy commits this act of charity for a woman the whole town has shunned, they only think of themselves and how it affects their reputations. Her family try to lure her home. But no, Valancy stays and starts pleasing herself. That means striking up a friendship with notorious loner, Barney Snaith. Barney of the soulful, violet eyes and tawny hair. sigh Where was I? Oh yes, Barney. He drives an unreliable car and was seen drunk one time. Scandal! When circumstances change and Valancy has nowhere to go, she makes a gutsy decision that takes her new outlook to a whole 'nother level. I LOVED this book. Let's just get that out there now. I loved Valancy. For years she's been thinking all sorts of clever things and her family have no idea. They think she's a pushover without an opinion of her own. But she's not. Even before her diagnosis, Valancy showed signs of rebellion. You can only push a woman down so far before she stands herself up. Once she allows herself the freedom to do and say whatever she pleases, she really let's loose. It's like a dam bursting. She tells it like it is and her folks have to pick their jaws off the floor. 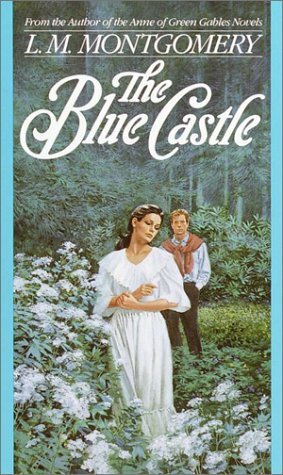 The Blue Castle sheds a light on what it was like for an unmarried woman at the turn of the last century in the small towns of Canada. Valancy can't have a career, she doesn't have her own home and relies on her family for her survival. They make her feel every bit of that burden. Valancy believes she has no other options so she lives in fear. I imagine there were plenty of women in her situation. Throughout the story, Valancy grows into a new kind of woman, one who does things for herself. She's fearless. I loved watching her transformation. Valancy gets some romance too. Woo-ee! I love that Barney Snaith. He's my new favorite literary hero. He doesn't cramp her style. They are true kindred spirits. They lead a freewheeling lifestyle without a care what others think. They spend a lot of time in the wilderness together. Nature plays a big part in the story. Valancy's favorite author is John Forster, a nature writer, his words helped Valancy in her darkest hours. Now that she is free to do whatever she wishes, she spends as much time as she can in the forest. The effect of this life on Valancy's soul is apparent on the outside. She becomes more 'elfin' and tanned. People hardly recognize her. Inside and out, she's changed. I could read The Blue Castle again and again. Where Anne of Green Gables is purply in its descriptions of the landscape, The Blue Castle is simpler. It's a maturer work. Valancy was a strong heroine for a newer audience; women taking control of their destinies in the 1920s. She's a woman they could relate to. And still relate to. Her fearlessness is inspiring. Too bad she didn't find it in herself sooner. When I first saw the cover of this book, I thought, no, not for me. But after reading your review, it sounds like a really great book. I'm going to check it out now. Great review! I've been trying to find this! I guess I have to order it online. Your review reminds me of why I wanted it so much! Considering I loved Anne of Green Gables and you like this book, too? Sign me up -- I'm going to go track this one down! Isn't the cover horrid? But the book is fabulous. Great review, Chris! It is the kind of book to read over and over. I've mentioned this before, but there is a musical of Blue Castle. It hasn't been performed on PEI in a few years, but is is equally wonderful. I'll have to get my hands on a copy. I loved the Anne of Green Gables series. I bought this book this year, and I don't buy many books. It's calling me from the shelf! This is one of my all-time feel-good books--I've probably read it over twenty times. I love Anne, but I think she'd have been even better if she'd had a bit of Valancy's edge. I'm so glad you enjoyed Blue Castle. It's one of my absolute favourites. i loved Anne but never read this book. Sounds lovely. I'll read it when I'm in a sentimental mood.